L-R Sierra Leone President Ernest Bai Koroma, Liberian President Ellen Johnson Sirleaf, Guinean President Alpha Condé receive the support of more than half a million ONE members, presented by ONE’s Global Health Policy Director Erin Hohlfelder. I work on global health here at ONE and with your support, we’ve spent months raising awareness of Ebola and busting myths about how it spreads. Months spent pushing governments to make bold commitments to help end the crisis, and then holding their feet to the fire to make sure they delivered. Months spent raising our collective voices to make sure decision makers knew this was a priority, even after the disease fell out of the news headlines. Today marks an important milestone in the fight against this disease. It’s now been 42 days since the last new Ebola cases were reported in Liberia. Why is this number so important? Well, according to technical experts, this marks the official end of the Ebola outbreak in this country, even though the global fight isn’t over yet. Our voices were heard. 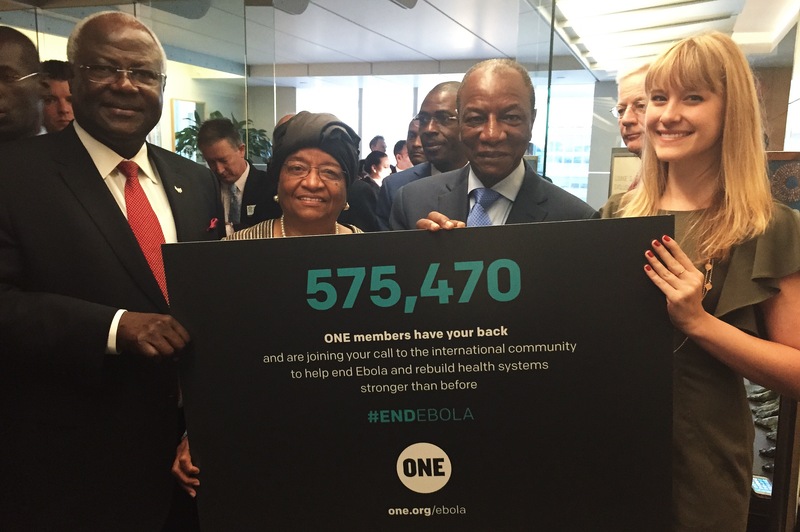 More than a half a million ONE members – from Monrovia to Madrid – signed our petition. Thousands shared our Ebola tracker to make sure governments knew we were checking their pledges matched the resources delivered. Thousands shared stories of heroic local workers on the ground and shared our video calling for urgent action. We got calls from government officials wanting to make sure we knew that they were delivering on their promises. We delivered every name straight to the UN, and to a high-level European meeting. And last month I had the honour of delivering every name to leaders of the countries hardest hit by Ebola. These three Presidents – President Ernest Bai Koroma from Sierra Leone, President Ellen Johnson Sirleaf from Liberia and President Alpha Condé from Guinea – wanted to say thank you for all the work you’ve done. But our work isn’t over. New Ebola cases are still being reported in Guinea and Sierra Leone, and we need to do more to stamp them out. As long as Ebola exists anywhere, it is a risk to individuals and countries everywhere. These three Presidents’ leadership, and the bravery of so many of their citizens in the face of the Ebola crisis, has been truly inspiring. But we have to keep fighting to make sure we get to zero cases of Ebola AND make their health systems stronger than ever before. THANK YOU to everyone who supported our Ebola campaign in some way. Make sure you’re part of future health campaigns – join ONE today.